On my culinary adventure to seek out the best bowls of ramen at proper ramenya’s, one thing remained consistent - high quality bowls were topped with a perfect half-cooked egg: a centered bright yolk the color of a gleaming sunset - just barely cooked, resulting in a thick liquid center that oozes all over your ramen with whites that are smooth as silk, springy but still firm, with no trace of grey or pale yellow anywhere. A perfect egg completes a bowl…but who has time to be perfect? My friend Robin can’t stand a runny yoke, I get it. So make your egg(s) the way you like them: half-cooked, fully-cooked, poached, raw, Japanese omelet style. Here are the recipes for three different egg options to suit your egg-fancy. I try to save time when it comes to cooking in my house, so this recipe is actually two. The ingredients I use to soak my half-cooked eggs in are the same as my mom’s recipe for teriyaki sauce. If you want to skip the teriyaki sauce step entirely, then that’s fine too. The other short cut – if you are making or plan to make Chashu or Kakuni, then you can use the braising liquid left over to soak your eggs in vs. making the teriyaki sauce below. This would be the preferred method. See recipe for Chashu and Kakuni here. * A simple way to grate ginger is to freeze it and use a microplane or Japanese ginger grater. No need to remove the skin. Ginger must be frozen for at least 6 hours. ** Poke a pin sized hole in the bottom of the egg to help easily remove the peel. Bring eggs to an even temperature in a warm water bath for 5 minutes. 1. In a medium saucepan over high heat, whisk together the shoyu, sugar, ginger and garlic in a medium saucepan. Once the mixture starts bubbling and the sugar melts, remove from the heat. Make sure it doesn’t bubble over. Stir in the mirin and cool to room temperature or refrigerate for at least 1 hour. 2. Bring a large pot of water to a boil. With a slotted spoon or a Chinese strainer, gently add the eggs to the boiling water, and immediately set a timer for 6 ½ minutes. 3. While the eggs are cooking, prepare an ice-bath for your eggs. And when the eggs are done, immediately transfer them to the ice bath. 4. Let the eggs cool in the ice-bath for about 10 minutes, remove the eggs and peel them. 5. In a container shallow enough so that the eggs can be covered in liquid, combine 3 cups water and 1 cup teriyaki sauce or 1 cup Chashu liquid. Add your eggs, put a paper towel over the eggs and cover the paper towel with bonito fish flakes. The weight of the paper towel will help marinate the eggs on all sides and the bonito will flavor the eggs. Let marinate and refrigerate for 2 days. 6. Remove the eggs from their soaking liquid, and cut in half with a very sharp knife. 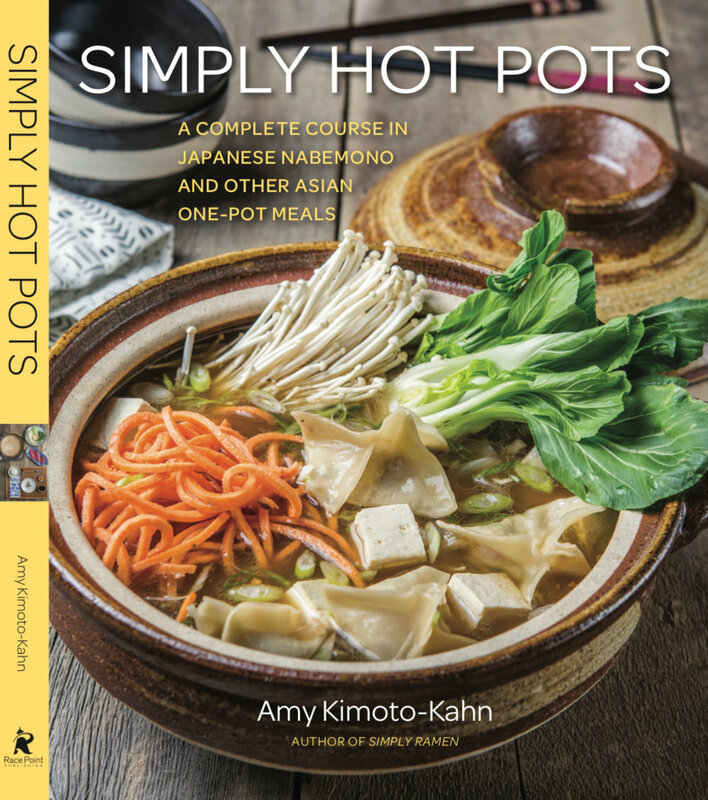 You’ll end up with a beautiful half-cooked egg filled with liquid-gold goodness, ready to complete any ramen recipe! Poached eggs aren’t as labor intensive as marinated half-cooked eggs and their runny center provides an instant sauce to swirl into ramen soup. Cook them ahead of time and when your other ramen components are ready to assemble, just warm the poached egges in the ramen cooking water for 10 seconds before slicing and gently transferring to the bowl. 1. Fill a medium-sized pot with about 1½ inches of water and bring to a boil over high heat.. Add white vinegar or lemon juice. This will help the eggs to coagulate quicker and reduce the amount of feathering around the edges, but don’t add too much or the eggs will taste sour. Once the water comes to a boil, reduce to just above a simmer. 2. Crack an egg into a small ramekin or cup. If poaching more than one egg, prepare up to 3 ramekins at a time. 3. Gently slide the eggs into the simmering water. Take care not to crowd the pan. I don’t recommend cooking more than three at a time. 4. Cook the eggs until the whites are opaque, about 3 ½ minutes. 5. 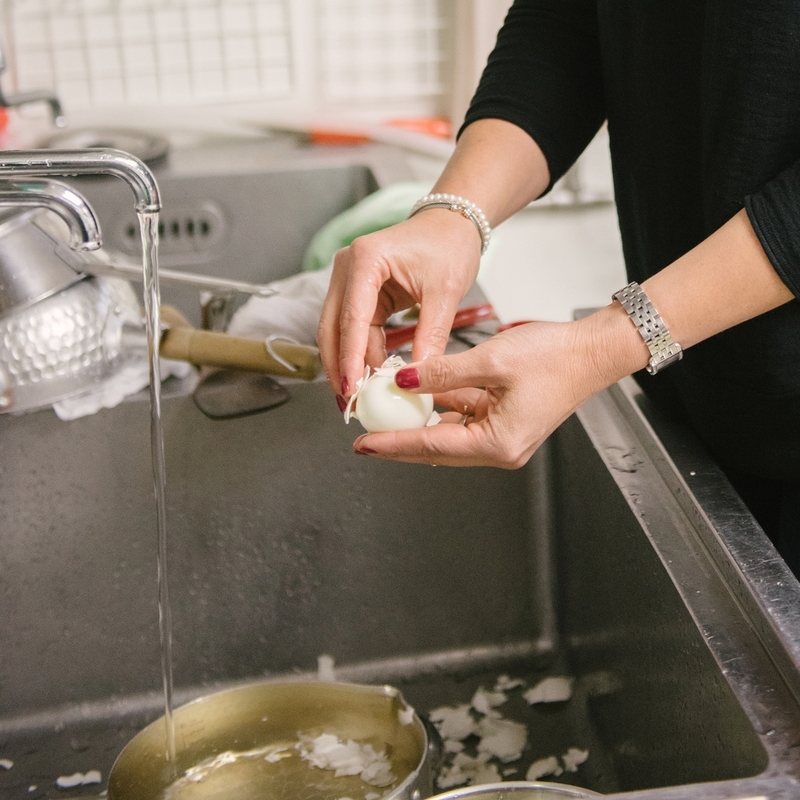 With a slotted spoon, transfer the cooked eggs to a paper towel to drain. If not using immediately, store in a water bath in an airtight container and refrigerate for up to 2 days. 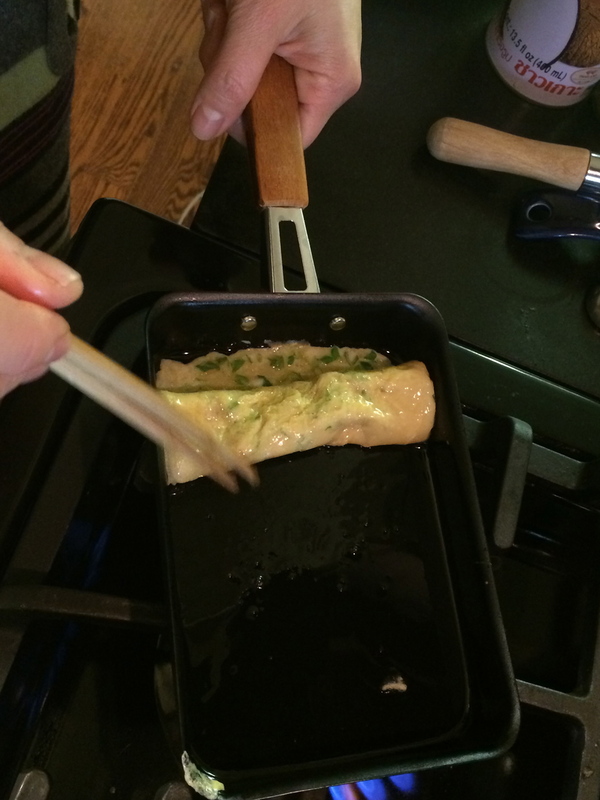 If you can get your hands on a Japanase Tamagoyaki frying pan, you’ll make a much more visually appealing omelet. If you don’t have one, a regular frying pan will work but you won’t achieve the same uniform rectangular shape that distinguishes this omelet. vegetable oil (use spray oil to make it easier to coat the pan between each layer of egg. 1. In a medium sized bowl, whisk the eggs with the green onion, shoyu, sugar and salt until foamy. 1. In a medium skillet over medium-high heat, warm 1 teaspoon vegetable oil into a rectangular tamagoyaki frying pan. Add a tiny bit of egg to the pan. If it sizzles on contact, the pan is sufficiently hot. Add about ¼ of the egg mixture to the pan and tilt the pan so that the egg mixture covers the bottom in thin even layer. The egg will start cooking quickly so you’ll need to move fast. 2. With chopsticks, gently roll the egg mixture tightly towards you from the part of the pan furthest from the handle until it resembles an omelet. 3. Quickly add a little more oil to the exposed part of the pan. 4. Pour another ¼ cup of the egg mixture into the pan, lifting up the cooked portion to get some egg underneath it to cook. 5. Roll the egg mixture away from you this time as it combines and attaches to the rest of the egg layer. Nudge it to the back to the front of the pan, where you started before. 6. Repeat two more times until you’ve used all of the egg, the omelet will obviously increase in size with each layer. 7. Roll the omelet out of the pan and you should have a rectangular shaped block with your layers of egg. Let cool and slice vertically before serving.